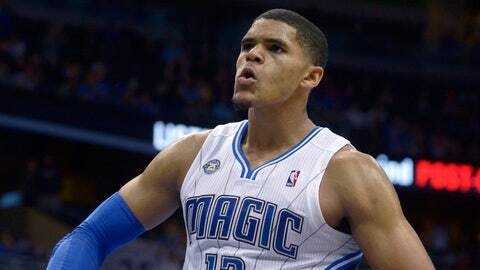 Magic forward Tobias Harris flexes during the second half of Orlando's home victory against the Hawks on Sunday night. ORLANDO, Fla. — Through 30 games, the Orlando Magic have the same record as the Brooklyn Nets and the Cleveland Cavaliers. Chances are their fans would have taken that with no questions asked before the season began. Now it might be more of a reflection on how things have spiraled out of control for the Nets and Cavs than any sign of rapid improvement for the Magic in their second year under coach Jacque Vaughn. But there was plenty of reason to be encouraged Sunday night after a 109-102 victory over the Atlanta Hawks. The Magic came within an eyelash of establishing a season high in field-goal percentage by hitting 55.4 percent of their shots. And when they need a 3-point field goal after falling behind early in the fourth quarter, they got them from several sources. Some 10-20 records are better than others. For a team which hadn’t won consecutive games since before Thanksgiving, the Magic hope this is the Christmas gift that keeps on giving. "I just think we had a very unselfish nature about ourselves from the beginning of the game," Vaughn said after seeing the Magic get 20 points from Arron Afflalo, 17 from Tobias Harris and 16 apiece from Nikola Vucevic and Glen Davis. That was far from the extent of it. Victor Oladipo, in his second straight solid outing in a non-starting role, turned in several crowd-pleasing plays on his way to 15 points and eight assists. Jameer Nelson keyed a decisive 9-0 run and finished with 10 points and eight assists. Even Maurice Harkless, whose second season in the NBA has not gone swimmingly, made a huge impact in the second quarter. "It’s impressive," Afflalo said. "It means that we’re trusting each other and the game is being played the right way. Thirty assists, seven guys in double figures — that means everybody is being aggressive, but they’re being aggressive with the right intent. If we do that, if we play for each other, we can compete with any team on a night in, night out basis." An illness kept Afflalo sidelined when the Magic began their six-game home stand with a listless 86-82 loss to the Utah Jazz. So he wasn’t going to let a turned left ankle which he suffered Friday night against the Detroit Pistons slow him down. "If you can play, play," said Afflalo, who logged a team-high 42 points in the Magic’s second victory in little over a month over the Hawks. "There’s no need for me to sit out. If you can’t play, go sit down. Don’t be in between." Not everything came easy to him. Afflalo had to chase point guard Jeff Teague on defense for most of the game. On offense, he was usually fronted by either Lou Williams or Shelvin Mack, with the Hawks sending over a second larger defender. Magic Musings: Ken Hornack takes a closer look at how Orlando took down Atlanta. 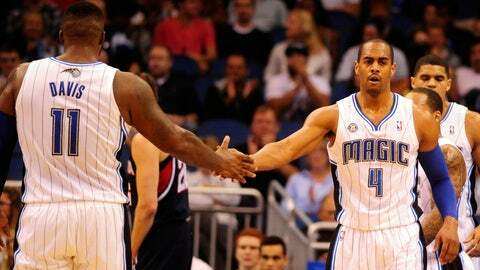 Recap: Arron Afflalo scores 20 as the Magic beat the Hawks for their second straight victory. "I’ve been seeing those (double-teams) the past few weeks," he said. "And my teammates are great. They’ve been hitting shots. They still set screens for me. If that’s going to be the case, I’ve just got to pass the ball and hopefully it comes back around." His seven assists were the most Afflalo had in a game since Nov. 11. But they didn’t cause the sort of crowd reaction Oladipo elicited in diving for a loose ball to trigger a fast break, swatting a layup attempt by Mack almost into the Hawks bench, and slicing through defenders on his way to the basket. "Our energy level was high," Nelson said. "And we have to keep it that way. We can’t have any letdowns, no matter who we’re playing." The victory was the first in 15 games where the Magic had allowed 100 or more points. But Vaughn will take those triple-digit outputs if it means they’re also scoring 22 fast-break points and coming up with 10 steals on a steady basis. "That’s the challenge every night," Vaughn said. "Now we’re starting to do it game by game. Can we do it quarter by quarter? And ultimately, you want to do it possession by possession." "It’s good to be on a win streak," Nelson said. "We’ve been on the other end of it a lot. We’ll enjoy this one for a couple hours, then get back to work (Monday) and prepare for the next opponent." That preparation will come with a little more pep in their step.